Habitat: Riparian. 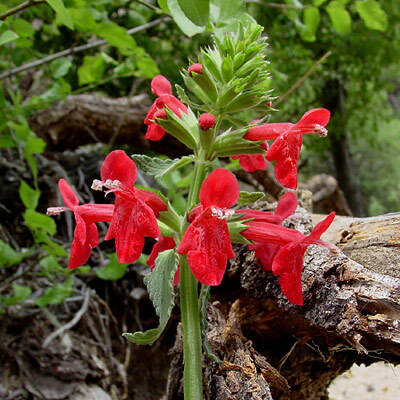 This attractive wildflower is found in moist canyons in the desert, uplands, and mountains. Description: The flowers are in multiple whorls near the stem tips. 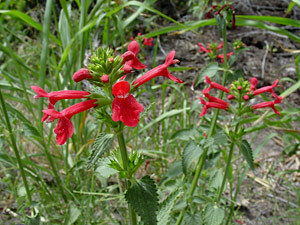 The individual flowers are tubular, 1 1/4 inches (3.2 cm) long, and 2-lipped with a single-lobed upper lip and a larger tri-lobed lower lip. The leaves have toothed or scalloped margins and are green, opposite, deeply veined, and triangular-ovate in shape. The leaves may resemble those of a Nettle (Urtica spp. ), but they are not stinging. The stems are green and square in cross section. Hummingbird Flower – The flowers attract hummingbirds.